When a wildfire is detected, the situation must be thoroughly examined to determine where the fire is and where it could spread. It is dangerous to start suppression without further investigation. Once the fire has been evaluated, decisions can be made as to what ground suppression activities are required. Wildland fire suppression seeks to establish a control line around the fire as soon as possible, cool down open flames that are closest to the edge, and separate burning fuels (trees, shrubs, moss etc) from unburnt fuels. The most commonly used method to achieve this is to apply water through a hose line that has been pumped from a fire truck or portable pump. In Nova Scotia, we are fortunate to have an abundant supply of water. Some fires can require a coordinated effort between several agencies. 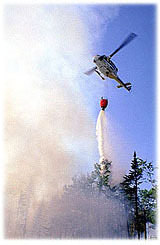 A small fire may only require the services of two people and a back tank, while a larger fire (15+ kms in length) can require hundreds of people and lots of equipment. Often, the local fire departments will be on the scene before the Department of Natural Resources. If the situation escalates, the police, ambulance services, the forest industry, Emergency Measures Organization and other agencies may become involved. Ground suppression activities can be rather intense when the fire's at its worse, but even after the fire's out, there can still be lots of work to do. It's possible for a fire to burn in fine combustible materials below ground without showing any signs on the surface. To prevent a flare up, hours can be spent looking for a small wisp of smoke. This could indicate a heat source below ground. If this is not done, the spark could surface and could once again become a running surface fire. There are times when a wildland fire moves too fast or is too intense for there to be safe ground suppression. In this case, aircraft are used to slow, or cool down the fire, to allow the ground crews to resume their efforts. DNR has a fleet of five helicopters stationed in Shubenacadie. Any location in Nova Scotia can be reached within 1 hour and 45minutes from Shubenacadie. They can perform many functions such as transporting people and equipment, dropping water, and also assist with reconnaissance efforts. The Bell 212 has the capability to carry personnel and equipment. During a mission, a 1477 litre (325 gal.) water bucket can be attached to drop water or foam. When all other fire fighting measures fail , the services of large fixed-wing airtankers are requested from another province. Our membership in the Canadian Interagency Forest Fire Centre (CIFFC) facilitates the sharing of resources between agencies.